Deutsche Welle (DW) and Bianor join forces to bring the German broadcaster’s on-demand videos to the connected TV screens around the globe. DW’s on-demand video library is now part of iMediaShare’s video channel lineup – available both in English and German. Bianor’s iMediaShare is a mobile solution that enables users to personalize their TV experience. It provides easy access to video and audio content from various sources to let people enjoy their favorite content on any connected TV. iMediaShare transforms the mobile handset into a personal all-in-one media manager that combines content portability with seamless media streaming and TV remote control functionality. “The content quality is key to the great TV experience. We are very excited to partner with Deutsche Welle and to deliver content from the leading broadcaster to the international audience”, says Metodi Filipov, Bianor’s Managing Director. “On-demand video consumption gains popularity as more people want to be in full control of what and when they watch. Unlike traditional TV broadcasting solutions iMediaShare is specially designed to address these needs”, adds Filipov. “Working with such an innovative company like Bianor provides us with a great opportunity to expand into new areas of business”, says Petra Schneider, Deutsche Welle Director of Distribution. “We really do have something for every iMediaShare user with a selection of on-demand content that ranges from business and politics to sports, music, lifestyle and the arts – all produced in the heart of Europe”. DW is once again contributing to the Young Media Summit, this year taking place from Tuesday, May 24 to Thursday May 26 in Cairo. The Young Media Summit is organized by Deutsche Welle’s DW Akademie in cooperation with the German Information Center Cairo. The conferences are being funded by the German Federal Foreign Office. The Young Media Summit will feature 18 German and Arabic bloggers who will meet to discuss “new media and reform in the Arab World”, leading up to a podium discussion at Cairo University on Thursday. In addition, DW will also be producing a talkshow during the conference, which will be broadcast throughout the Arab World on May 27. If you want to find out more, just check out the Young Media Summit website. Deutsche Welle (DW) will increase its focus on television, online and mobile services and decrease its shortwave broadcasts in a process starting this summer. Starting July 1, 2011, DW will be making major changes in how and when its radio programming is broadcast in Asia and Europe, as well as German radio programming as a whole. The measures will ensure the further development of Germany’s international broadcaster to a truly multimedia organization. DW will focus on modern modules that can be integrated into partner’s FM line-ups as well as being offered as stand-alone, on-demand services for the Internet and mobile devices. DW will thereby increase the cooperation with its partners throughout the world. With the exception of Africa and parts of Asia, linear shortwave broadcasts will be discontinued due to limited usage. The resources that have been saved will be reinvested in projects for the future – especially in the development of television services with regional languages and content, as well as an increase in online and mobile services. DW will aim to use its available resources to offer two TV channels per region. This will give viewers the opportunity to choose between a channel with predominantly German programming and a channel with a focus on one of the regional languages – English, Spanish or Arabic. DW has started a new partnership with the television network RBC, the leader in business and financial reporting in Russia. Live commentary from DW’s Russian editorial team was integrated into RBC’s primetime news program for the first time on May 12. 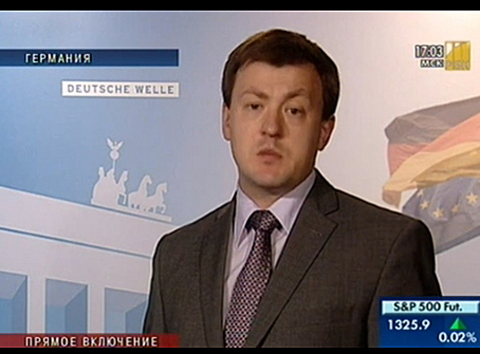 The commentary focuses on current, bilateral topics and viewers benefit from the expert opinions from Germany – presented by DW’s Russian service. The two media organizations are planning on broadcasting two to three live commentaries per week. If you haven’t seen it yet, the DW Media Center is a good place to start to get an overview of all the audio and visual content we have to offer. For example, check out Land of Loveliness – a euromaxx series featuring Michael Wigge exploring interesting locations in Germany. Every week he visits some of the most interesting tourist sites and explores each location with a special day job.